The problem is concrete. Paved surfaces contribute to storm-water pollution, whereby rainwater carries toxic urban pollutants to local streams and rivers, greatly degrading water quality and riparian habitats. Pavement also disconnects us from our natural world. Eric Rosewall traded hats recently, leaving Depave and joining PP&R. But his job continues to concentrate on greenspaces. Eric Rosewall grew up in southwest Michigan and moved to Oregon in 2003 after visiting Seattle and falling in love with the lush botanic wonders of the Pacific Northwest. He earned a University of Oregon degree in landscape architecture. In 2009, Eric got involved as a volunteer at the outset of the now internationally recognized nonprofit organization Depave. He deployed a tool he had always used: a camera. He would take shots of the community coming together and smashing pavement. Eric would chronicle these events. His love turned into a paid career. During Eric’s stint at Depave, more than 151,000 square feet of asphalt was depaved – almost exclusively by hand – to create 52 new community greenspaces in Portland. At Depave, Eric could be seen steering the ship and wearing many hats: organizational development, partnership building, fundraising, project and volunteer management, financial oversight, landscape construction and graphic design. 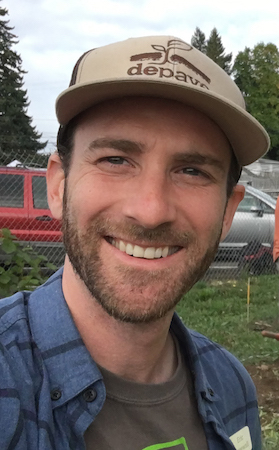 Last September, he left as executive director to lead Portland Parks & Recreation’s (PP&R’s) new Ecologically Sustainable Landscapes program. But he’s still active with Depave, and you’ll find him at the April 12 fundraiser. “Similarly to my work with Depave, my role with PP& R requires being a jack of many trades to build a program to create urban greenspaces through community collaboration,” Eric reported. Now he reaches out to relevant organizations in the name of how much people value parks. This program is geared toward involving the community. He brings people together to take ownership. He attends neighborhood association meetings – including his own here in Concordia – to build awareness and get people involved. For example, the Alberta Park stream bed was built by a local Boy Scout troop. The city partners on Alberta Park development with the Columbia Slough Watershed Council and is planning a ribbon cutting ceremony there May 5. “Hopefully people will see plants and think they are cool,” Eric noted. “Maybe they’ll seek them out and create their own little nature patch.